The centre of the Wheel of Life. In this image: ignorance is represented by a pig; attachment/desire is represented by an Indian bird known for its attachment to its mate; aversion/anger is represented by a snake, since it is quick to strike. Destructive emotions (Skt. kleśa; Tib. ཉོན་མོངས་, nyönmong, Wyl. nyon mongs) — the negative, destructive emotions which are the cause of suffering. Some translators prefer not to translate klesha as 'emotion', because, as they point out, we would not immediately think of delusion and doubt, for example, as being ‘emotions’. The three main destructive emotions (or three poisons) are ignorance, attachment and aversion. When classified as five, pride and jealousy are added (the five poisons). Pride is a combination of ignorance and attachment, and jealousy is a combination of attachment and aggression. All the destructive emotions and mental states are essentially distorted, whereas the antidotes, such as love, compassion and insight, are undistorted and based on how things really are. The antidotes have the quality of being strengthened through training and practice. The essential nature of the mind is pure and undefiled by the destructive emotions. "Ignorance is the most fundamental of the kleshas, but also the most difficult to work with, so we need to begin with our attachment and aversion. Traditionally the teachings begin with attachment, but I think it is easiest to begin with anger or aversion. Attachment is so strong in us we are not really ready to work on it. Of course, if we can deal with attachment then aversion is taken care of automatically, whereas dealing with aversion will not necessarily rid us of attachment. But most people are not prepared to work on their attachment straight away, although they can quite easily see how anger and aversion are destructive and unpleasant. In a sutra it says this very clearly. It says that of the three poisons, ignorance is the most basic and pervasive. It is like the earth. If we can rid ourselves of this, we will rid ourselves of all the negative emotions, but this is difficult precisely because it is so deep and fundamental. Yet ignorance does not cause us acute pain or present immediate difficulties, nor will it throw us into the hells. So we can deal with it more slowly. Then attachment, it says, is like water: it is very pervasive. It causes us pain and suffering and it is not easy to get rid of. Attachment is not all bad—it has both a negative and positive side, e.g. compassion and love, or the resolution to become enlightened. We can be a little patient with this too. Water takes a long time to dry up. Aversion is compared to fire. It has almost no positive side. Wishing harm for others will always bring us suffering for others and for ourselves too. Aversion then is where we must begin. It has the quality of a flame: it bursts up very quickly and can burn away everything, but when the fuel is no longer there it will go down again just as quickly." In the Hinayana, the shravakas and pratyekabuddhas abandon [destructive] emotions or bring them to cessation. In the causal vehicles of philosophy, the bodhisattvas purify them. 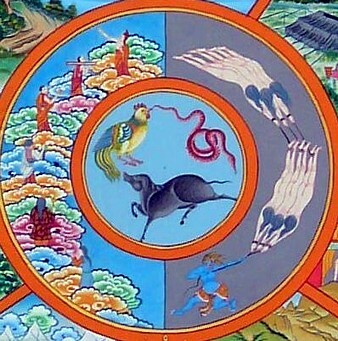 In Mantra, the followers of the Outer Tantras transform [destructive emotions] while the followers of the Inner Father and Mother Tantras take control of them. For a practitioner of Atiyoga, the object of abandonment and its remedy are of one taste. ↑ Quoted in Jamgön Kongtrul and Khenchen Thrangu Rinpoche, Creation and Completion, Essential Points of Tantric Meditation, Translated by Sarah Harding (Boston: Wisdom Publications, 1996-2002), page 156, note 8. ↑ In the Nyingma tradition, these inner tantras correspond to the Mahayoga and Anuyoga tantras. ↑ Jokyab Rinpoche in Light of Wisdom, Vol. Two, translated by Erik Pema Kunsang (Boudhanath: Rangjung Yeshe Publications, 1986-98), pages 157-158. This page was last edited on 9 January 2019, at 10:33.